On Sunday I went to Exeter to see gillpolack, who was visiting the UK from Australia for a few days. 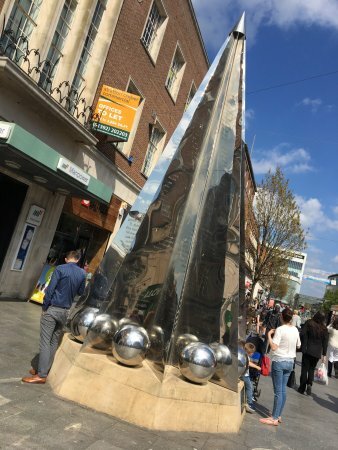 A very pleasant time we had, and we amused ourselves with the Exeter Book sculpture, a modern stainless steel effusion in the pedestrian precinct that I have walked past many times on previous visits without realising that it had mirror-written Anglo-Saxon riddles carved into it, easily legible in the shiny steel of the adjacent surface. It was good to see gillpolack again, and she gave me a bag of interesting goodies, including citrus peel dipped in dark chocolate, which was delicious. On Monday I got the same train in the opposite direction and rode it to Wolverhampton, scene of my childhood holidays. Stands Beatties where it did? (No.) There I met up with Gaby Steinke, whom I first met at the Diana Wynne Jones conference back in 2009 - but who is also the programme leader for an MA I'm externalling. (Yes, "external" is a transitive verb - deal with it.) The exam board meeting, in a room with an excellent view into the Molineux, was fairly pedestrian, so I'll just share a couple of side observations. When I asked for a receipt from the taxi driver as I arrived at my hotel, he just handed me a blank card, evidently expecting me to sign his name and fill in the amount myself. When I demurred, he told me I was the first person who'd ever objected to this accounting method. (I had to lend him a pen.) I wonder how much fraud is perpetrated by this simple expedient? The Black Country (which I sincerely wish were a musical genre and not just an area of the Midlands) is of course at the heart of the old Mercian kingdom, where Woden was at one time the primary object of devotion - as reflected in names such as Wednesfield and Wednesbury. I was pleased to notice on a street map that there is still a Woden Primary School, where I like to imagine that in assembly the children join in prayer to "Allfather, who art in Asgard". And then to Cardiff, to Cardiff, to Cardiff, on Wednesday, Thursday and Friday. This week I had the pleasure of teaching Black Hearts in Battersea, but in the process realised that I'd made an error in Reading History in Children's Books, when I suggested that Lord Battersea's castle is "more or less on the site of Battersea Power Station". That's not wildly off, but in fact it's in Battersea Park, on the river next to Chelsea Bridge. This is a poignant discovery, because the castle is known for that rousing piece of music, the Battersea Fanfare - which is a pun on the Battersea Funfair, built for the Festival of Britain in 1951 and very much up and running when Aiken's book was published 14 years later. I imagine many people would have caught the pun at that time. Sadly, the fair shut down in the wake of a fatal accident in the early '70s, and has slowly faded from public consciousness, so now the pun has been stranded on the shores of time, much like Robert's joking reference to Rosherville pleasure gardens in The Story of the Amulet. Anglo-Saxon religion tended to be locative which is why when they arrived in England (or Britannia) they became Christian so easily, shrines were all wood groves in (what is now) Germany. I don't remember how this works in the UK, but in the US, when you pay for a restaurant meal by credit, they bring you two copies of the slip, on which you write the gratuity and on one of which you sign your name and give back; the other is for your records. Having actually twice had the experience of finding, when my credit statement came, that a restaurant had helped itself to a larger tip than I'd chosen to give, I've noticed that the opportunity for fraud from the purchaser is also there. A search on YouTube produced no results for the Battersea Fanfare, but did turn up the Battersea Funfair (or Fun Fair). Obsolete jokes of this kind are common, as are those which lose their savor crossing the Atlantic (e.g. Harry Potter's Spellotape), or which sail over the heads of child readers. I may have mentioned this before, but I would like to recall which book I read as a child in which a character remarks, "A poached egg isn't a poached egg unless it's stolen from the woods in the dark of night." A rather clever joke, actually, but as I hadn't heard of either kind of poaching at the time, this line sailed straight over my head. It was so puzzling that it stuck with me as a mystery, and the penny dropped years later as my vocabulary improved. I can't remember the last time I had to sign to pay with a credit card! I too am one of the privileged ones with the citrus peel. It is most tasty!